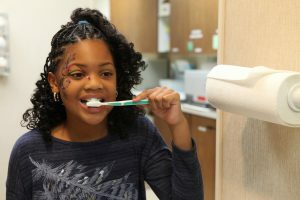 The sooner a child learns healthy dental hygiene, the better they will be throughout their life. 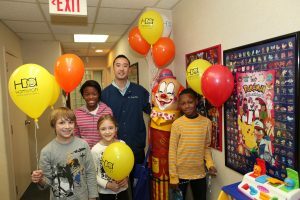 We make dental visits as painless and fun as possible – from explaining what is happening and why, to distracting kids with fun activities. Our staff has decades of experience treating children – they are in great hands. Of course, our team cleans teeth, applies fluoride and explains the importance of a healthy diet and proper brushing. We make sure to check for possible problems in mouth development, including crowding, gum disease, and TMJ, as well as prolonged problems, like thumb sucking and teething. Ordinarily, baby teeth are pushed out by permanent teeth pushing through. However, when a baby tooth is lost early to tooth decay or trauma, it may take years before the permanent tooth is mature enough to enter the mouth. In that case, we may apply a dental space maintainer to preserve the opening. This protects the adjacent teeth from drifting into the vacant space and allows a proper opening when the permanent tooth is ready. Space maintainers are useful in the short term, but also limit the amount of future orthodontic work. Proper brushing technique is important to learn at an early age. Our trained staff will help children learn how to brush correctly, reaching all surfaces and gums. We will walk the children through the process, demonstrating and helping them learn each movement. Flossing removes food residue from between teeth, where brushing doesn’t reach. Flossing is an important part of proper dental care. While your front teeth form the basis for a great smile, it’s your back teeth (molars) that do most of the work actually chewing food. Molars are contoured with pits and grooves to help break down food products. This constant work also makes them subject to excessive decay, which can begin early in life. Dental sealants safeguard molars from tooth decay. Chips, gaps, or misshapen teeth can mar a beautiful smile. Dental bonding is commonly used to restore decayed, cracked and chipped teeth; improve the appearance of stained teeth; close spaces between gapped teeth; and change the shape of teeth. With bonding, you smile can be restored with a simple, non-intrusive procedure that attaches a resin to your tooth enamel and hardens to appear and act as part of the tooth. Bonding is a less complicated alternative to crowns or veneers. 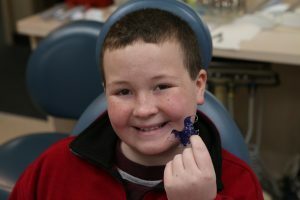 Braces are one of many tools used to create a beautiful smile. They help correct certain types of abnormal bites such as overbites, crowded teeth, and gapped teeth. There are many options and types of braces, which vary depending on the degree of orthodontic work that is needed. Braces are common and are used to gently move teeth over a period of time. Straight teeth not only look better, but they are also easier to clean and keep healthy.